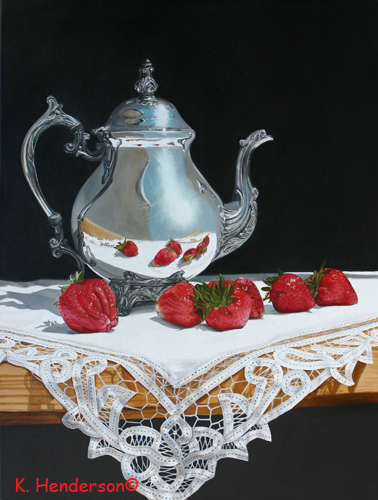 Coffee and Strawberries,24″ x 18″ on canvas. The coffee pot is a 19th century family heirloom which has been past down to me. 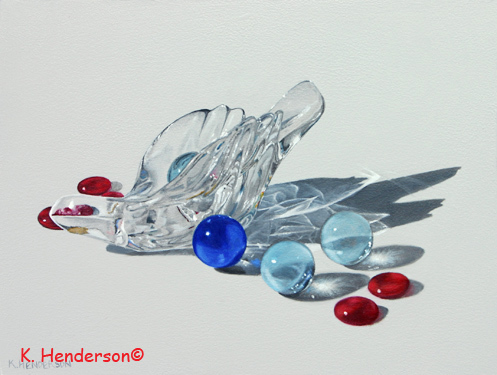 I chose this subject because I like painting reflections in silver. No Man’s Girl – Cowgirls! You gotta love Cowgirls! The title comes from the pulp fiction book cover in the background. Red is my favorite color and this painting has plenty of it! 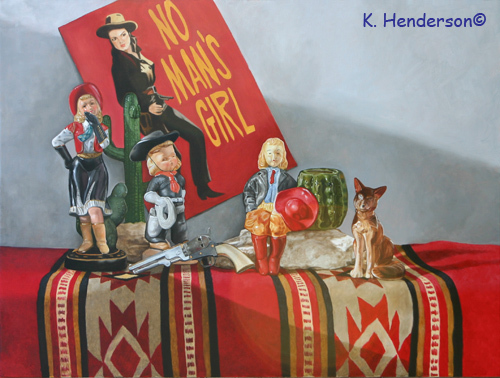 The painting includes vintage ceramic cowgirls, a dog (or is it a coyote?) cactus, a six-shooter and an Indian blanket to keep the cowgirl warm at night. 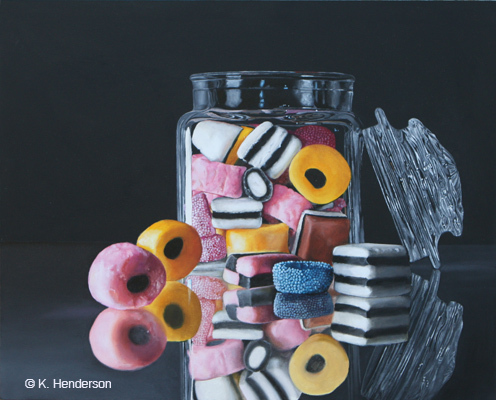 I love to paint pastry. I love to eat pastry. A marriage made in heaven. 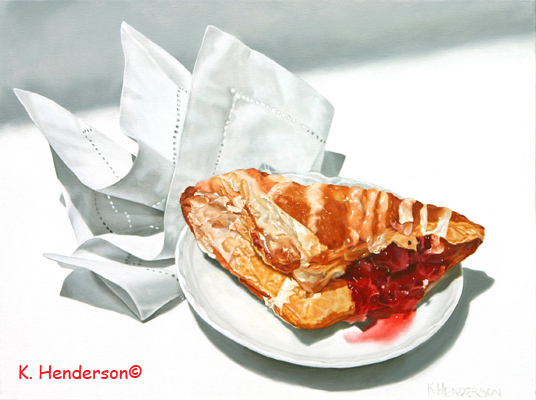 The flaky pastry and the red cherries provide the perfect contrast against the antique bone china and the linen napkin. 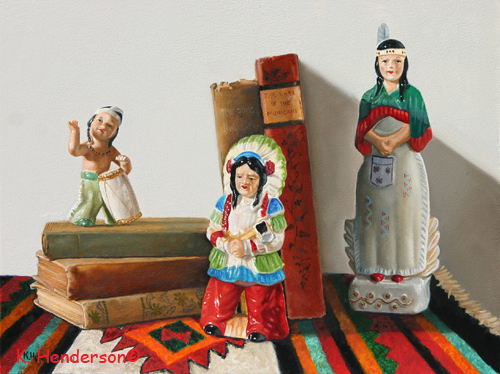 The vintage American Indian ceramic figurines are shown with several antique books. 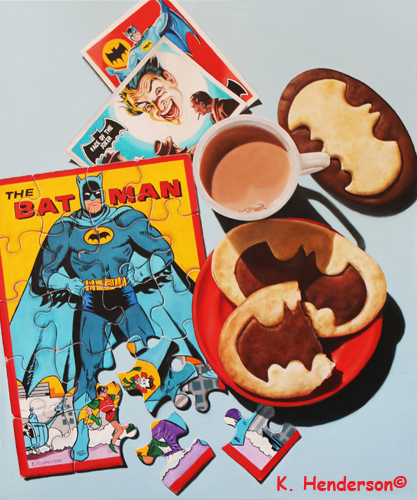 This is a Trompe L’oeil painting. Trompe-l’œil (French for “deceive the eye”, pronounced [tʁɔ̃p lœj]) is an art technique that uses realistic imagery to create the optical illusion that the depicted objects exist in three dimensions. 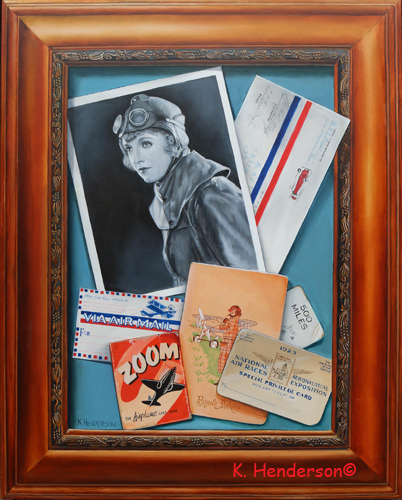 The ‘frame’, (not a real frame but painted onto the board) encircles a photo of an early aviatrix, an airmail envelope, parts from aviation games and more. This painting will be included in the Traveling the West art show in Dallas later this year. More info to come about this show. Stay tuned. 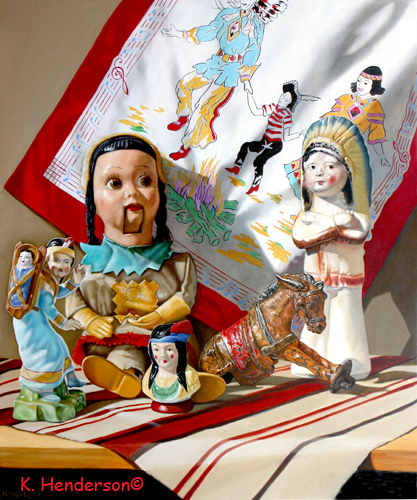 Summerfall is another of my contemporary realism oil paintings featuring my vintage toys and ceramics. The main figure is the Indian Princess marionette, Winterspring Summerfall, from the Howdy Doody television show. Also included is a vintage scarf, a chalk figure (the kind you used to be able to win at carnivals) and a mule from an 1800’s mechanical toy. Welcome to my Vintage Card Game Series of paintings. These are small, fun trompe l’oeil oil paintings of cards from vintage games. 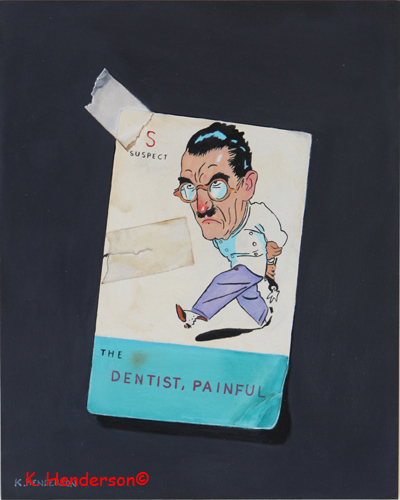 My first offering is The Dentist from the 1938 game ‘Who is the Thief’.